They say life is a journey. Some say art is also a journey. 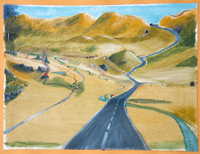 Peter has been influenced by a number of other artists, whose work has awakened in him the inspiration to complete a series of paintings entitled “Journey”. A painting titled “Paradise Park” by another artist and entered into the first Norvill Art Prize in 2000 was a major influence. It was 4 ft by 4ft, oil on canvas, no frame. It depicted, apart from some of the rocks so well known to the surrounding hills, a winding narrow tarred road and a few tiny houses that left nothing to guess but that it was the little town of Murrurundi. I took one look at it and, although I didn’t know it at the time, I was off on a journey of my own. Another painting that was entered that year by a Quirindi artist that also grabbed me was of a rocky gorge and waterfalls, semi abstract. It was magnificently and expensively framed. I bought it and some years later gave it back to the Norvill Art Prize committee as part of our collection. Something much more was happening here. Almost immediately I started to paint my own interpretation of Murrurundi. I used oils and similar colours, which were basically yellows. While the "Paradise Park" painting was an aerial view, mine was ground level. I had everything down, and only to paint in the houses. But that was it. I never finished the work. Already I was moving on at a furious pace. Already I knew the next step. I grabbed another board and the ‘landscape’ artist mind shut down allowing the ‘surrealist’ mind to emerge. OK, it’s a combination of both. This time I used gloss enamel oil house paints (not for any special reason but rather because I was wanting to try them). I brought in headstones to represent the cemetery, the Roman Catholic church, railway station and telephone lines. Yes, the houses of the town did get finished this time. The next leap of the painting, a larger board 3ft by 4ft, and this time the main street of the town was left out. The focus was the church (in Polding Street), headstones, railway and phone lines. The railway line and road run off into the distance over the Great Dividing Range. Last of all a woman in a long, dark red dress was added walking along the road in front of the church and a man on the railway platform. The man is looking toward the woman. I wasn’t sure what they represented but somehow I knew they were important. The colours were now much darker than the initial yellows. It remained untitled at this point. No further works of this type were done for a long time. But I knew one day I would return to it. I liked it too much not to return to it. A visiting art critic and teacher looked at this last work, and others, saying, “That is the best thing you have ever painted!” I was flattered and shocked. I never consider myself an artist. I’m too much an uneducated amateur. This painting was never far from me. I saw it in passing every day. One day the name “The Journey” popped into the head. It was time to return to work on “The Journey”. When I did recommence “The Journey” again, it was in acrylic and increased in size to 6 ft by 4 ft. The headstones became one headstone, and the woman was brought back to be appearing to hide behind it. She watches as a funeral procession emerges from the church and proceeds toward her. The man remained on the railway station platform but he had become less dominating or sinister looking and when, before, he looked toward the woman, he later looked up the railway line, seemingly not to even be aware of the woman or funeral procession being played out just across the track. The final one to date was the same size but in pastels, charcoal and graphite. The only significant change was the addition of a young girl accompanying the woman behind the headstone. Hundreds of works have been submitted to the Norvill Art Prize and I have seen thousands of other works over the years. But none have had such powerful influence in my own direction than did that entry in the Norvill Art Prize back in 2000. I wondered why. I have no doubt it comes from within the depths of our similar thinking minds, but I can’t even start to try to explain it. That Norvill Art Prize painting had taken me on a fantastic journey of my own. And I’m not sure it is over yet. Maybe that journey will recommence once again some day.